Following the alarming results of Brazil's recent general election, a conversation with Greek-Brazilian architect Demetre Anastassakis offers insight into the nation's social housing and Rio de Janeiro's post-Olympic landscape. Since the 1920s, Rio de Janeiro has been characterized by intense and ever-increasing informal urbanization, concentrated in slums known as favelas. Around 1.5 million people – one quarter of the city’s population – reside in informal settlements today. Favela dwellers live in precarious conditions with limited or ambiguous land rights and nonexistent services (except for those provided through self-management). Their daily life is plagued by incidents of gun violence from clashes between drug traffickers and police. While the government has made efforts to provide new social housing – such as the accommodation provided by the Minha Casa Minha Vida program – many of these have often been criticized for reproducing existing social inequalities. Most favela residents and their advocates support the notion that the land rights of favela dwellers should be recognized, and relocation programs avoided.This would work in tandem with the favelas’ integration into the city’s formal system, through an array of upgrades: from installing sewage systems and street widening, to providing garbage collection. Urban inequality has been exacerbated by the current political climate, and the transition to right-wing governments at both local and federal level. The financial and political crisis had already begun in the state of Rio de Janeiro by the time preparations were being made for hosting the 2016 Summer Olympics. Nevertheless, the plans of mayor Eduardo Paes (a key player in orchestrating the Olympics, whose tenure ended in fall 2016), continued without reconsideration. Olympic-urban transformations focused on the expansion of the city’s transportation system, the redevelopment of the port area known as Porto Maravilha, and the privileging of the wealthy suburb of Barra de Tijuca in the west part of the city; where the Olympic park was placed. They have been criticized as plans that support neoliberal urban development, increase privatization of the city’s assets and public space, promote an elite view of the city, and usher in a new era of speculative development. Development spurred by the mega-event was also associated with the displacement of vulnerable citizens across the city, and the criminalization of poverty through the application of urban beautification and standardization policies in Rio’s iconic public spaces. At the same time, there has been a long tradition of urban activism and a keen awareness of the need to resist uneven urban development. Thus, there has been a legacy of collaborations of disenfranchised communities with architects and planners in developing and advocating for alternative spatial practices and plans. Representatives of progressive approaches to planning are often present in local, state and federal administrative agencies, such as the Ministry of Cities, especially since the rise of Luiz Inacio Lula’s Workers Party (Partido dos Trabalhadores). Therefore, it would be inaccurate to perceive the urban politics of Rio de Janeiro as being fully dominated by the conventional dichotomies; ie between authoritative versus bottom-up planning, or approaches to urbanization defined by financial speculation versus concern for social welfare. For such reasons, it is not surprising that an architect such as Demetre Anastassakis has frequently worked with state and municipal authorities, without hesitating to distinguish his position when necessary. In this interview, conducted in July 2017, Anastassakis discusses his own two-decade spanning work in the context of the city’s urban politics. Maré and Bento Ribeiro Dantas settlements in Rio de Janeiro, designed by Demetre Anastassakis, 1996. Demetre Anastassakis was born in Athens, Greece in 1948. At the age of eight his family moved to Brazil during a period of intense immigration of war-stricken Greeks to other countries. Anastassakis studied architecture at the University of Rio de Janeiro (UFRJ) and graduated in 1973, after a delay of two years due to his imprisonment as a member of the Communist Party of Brazil (Partido Comunista do Brazil). As Brazil faces the political darkness of President Jair Bolsonaro, it is perhaps more crucial than ever to revisit alternative visions for the future of the country’s complex built environment. JT: In Brazil, your name is associated with the architecture of the favelas. As an architect of the left, could you speak about social architecture in Brazil and its relation to politics? DA: A very important social project that we did in Rio in the ‘90’s is the “Favela Bairro” [Favela Neighborhood] project. I was president of the Architects Association of Rio [Instituto de Arquitetos do Brasil]. The Secretary of Urban planning in the municipality was Luiz Paulo Conde, who later became the mayor and the governor of Rio. Conde was a professor of Architecture, with a large office, and he was the one who established an “architectural empire” at the municipality. There are two different approaches concerning the favelas. One is from the Peruvian theorist Hernando de Soto, who claims that our main goal should be to give out titles of ownership to favela inhabitants. 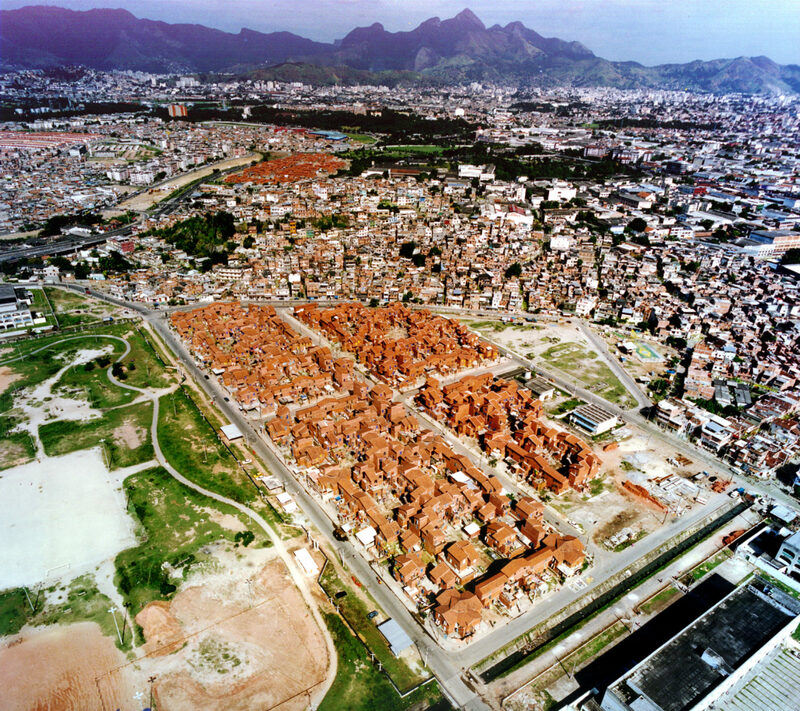 He also states that, if the inhabitants don’t want new housing developments, we can’t take it upon ourselves – as representatives of the bourgeois class – to construct them for the people who live in the favelas. Then, there is the right wing that wants to relocate the poor from the favelas in order to attain the land, since this land doesn’t officially belong to its inhabitants and the constructions have often been built without permits. But there is an in between ideology, that says anything that was built well inside the favela should be salvaged and restored, while making some new adjustments to the structure wherever necessary; such as opening up roads, repairing the sewage installments, building new houses and so on. That was “Favela Bairro’s” main goal, which we tried to accomplish after winning a large national competition. At first the competition was set for 15 favelas, and later it expanded to include 300 more favelas, sponsored by the Inter American Development Bank. I had personally worked on several projects in favelas prior to this competition and continued doing so after I wasn’t the president of the board anymore, when we took part in competitions and designed projects such as the Vigário Geral / Parada de Lucas, the Santo Amaro, Grota in Rio, the Peinha in São Paulo, the Novos Algados in Salvador, Bahia, the Independência in Petropolis, etc. JT: Did you conduct all of these projects through your architectural office? DA: Most of the projects I mentioned were completed through the collective: Co.Opera.Ativa – Cooperativa de Profissionais do Habitat in Rio de Janeiro – that we began in 1989 in Rio. Our collective, of which I was president, grew to have 23 members: around 17 architects, one sociologist, one economist, one philosopher, two civil engineers, two designers, and others. We won a lot of competitions. We would always disagree! We also did the project for the municipality of PeTe (Partido dos Trabalhadores) in São Paulo that was considered very successful, and from which even more project opportunities were born. For instance: housing in the favela of the Maré and the Cidade de Deus in Rio. 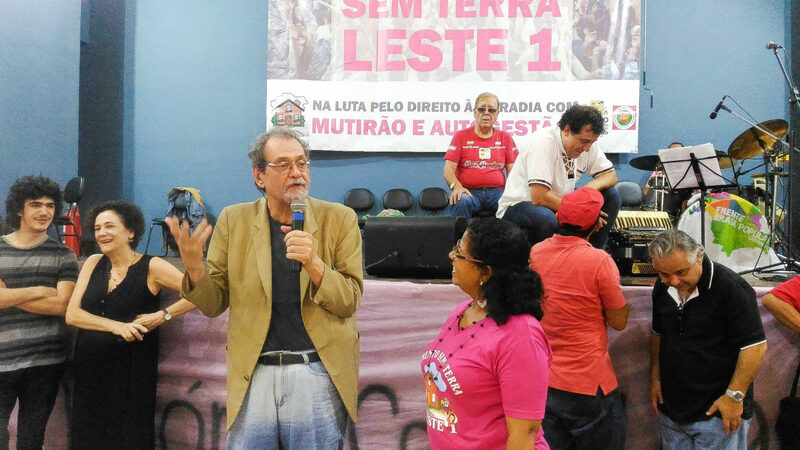 Demetre Anastassakis at the celebration of the 30 years of the Movimento Sem Terra Leste 1 responsible for the construction the São Francisco settlement, 2017. JT: What role did PeTe play, being a party of the left, in the empowerment of the social architecture that is evident in Brazil after the 1990’s? DA: In 1989, the first big municipality of PeTe came into being in São Paulo, under Luiza Erundina. Erundina was a sociologist and came from the movements of the local communities; she wanted to offer support to the city’s poor. In 1990, we won a competition that she announced, and we built two districts in the area São Francisco. JT: How did the citizens respond to these initiatives of the municipality? DA: First of all, this initiative in São Paulo had begun much earlier. The citizens – both from the favelas and those who were renting their apartments – were part of local organizations for 10-20 years, aiming to attain a home. There were 30-40 local organizations then, and when PeTe ran the municipality they sponsored the construction and gave them the right to stay in these homes for as long as they lived, as long as they paid a fixed rate each month. That wasn’t rent. The building belonged to the city, but as an inhabitant you live there with security, and the lease was passed down through generations. JT: So the inhabitants had ownership over the initiative in some way? DA: Not only that; the citizens built the buildings with their own hands. At the time that the competition was held in São Francisco there were no federal sponsorships for the construction. The municipality would give us the money to build, but it wasn’t enough. So, the building was completed through the mutirão system. Mutirão means that the future inhabitants of the buildings would participate in the construction. Every family donated 16 hours a week. The elder women would watch over the children and one of them would cook for everyone. During these communal meals, social relationships would be nurtured as well. It took them only 18 months to build 600 homes using this system. 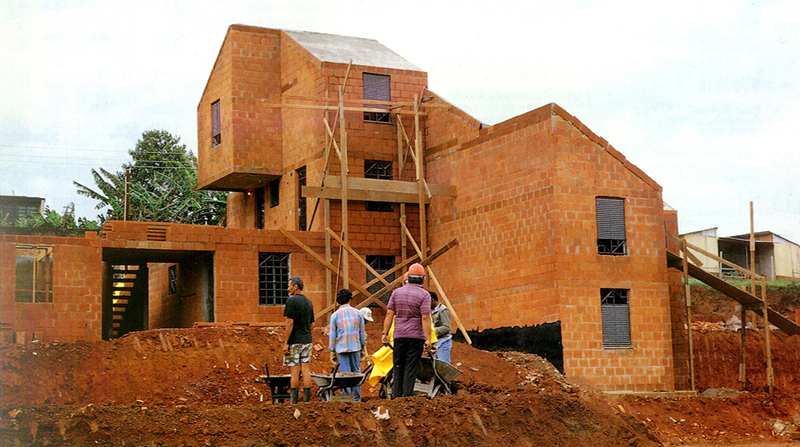 Participatory construction (mutirão) of São Francisco settlement designed by Demetre Anastassakis in Sao Paolo, 1991. JT: These buildings aren’t the usual modernist structures that we see in the workers’ districts. DA: This system that I used in São Francisco is the Lego. And I don’t mean it to be metaphorical. I used legos in the design. So the dimensions of this white Lego brick, for instance, are comparable to those of a 3×3 real brick in a 1:200 scale. If this is 3x3m, this is 3×4.5m, and so on and so forth. The traditional common house in Brazil is usually 3x3m. There are studies by the University of São Paulo that claim that this size moderately fits a bed, a dresser etc. The minimum height, by law, is 2.60m. JT: And the outdoor space? DA: Every 8, 12, or 16 houses have a communal space that shuts with a door and at night is used as a parking space. This is similar to the so called villas built by Portuguese and Italian residents of Brazil. JT: I notice that in many projects you leave the bricks exposed in the structure. DA: This brick was designed and patented by us. We call it bloco ceramico estrutural [structural ceramic brick]. It has holes in it and it is very resistant, almost as resistant as cement. You can even make a slab with this brick. The construction is similar to that of wooden flooring. You place the bricks, the one next to each other, and on the top you pour the cement. 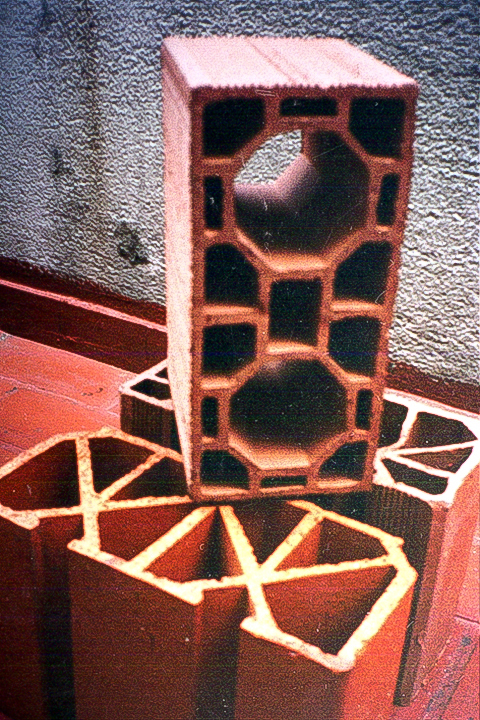 This technique is very good for the mutirão system, because even non-professional builders can very easily make it themselves. In São Francisco we realized that women were the best builders! Bloco ceramico estrutural (structural ceramic brick), patented brick designed by Demetre Anastassakis. 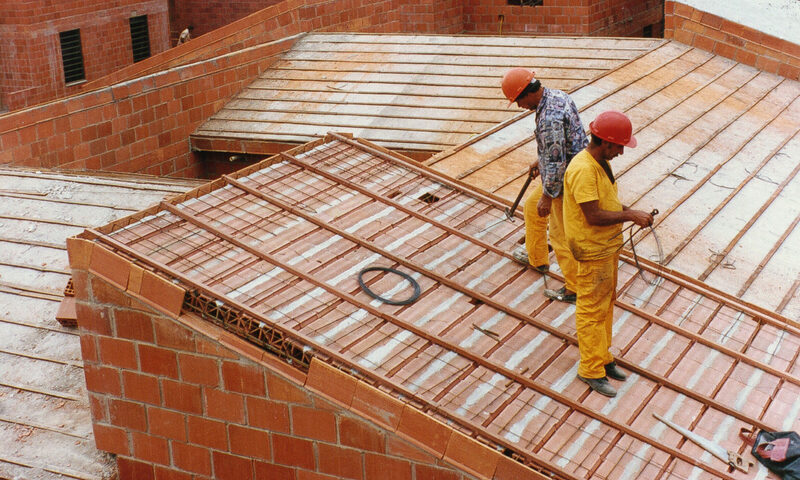 Roof construction at Maré settlement. JT: I would like to talk about the most recent project you worked on, the housing complex in Saúde, in the port district, where your own house is located as well. DA: Saúde is São Francisco’s cousin. It was formed a few years later. It was made on a very low budget so that it could be sold for a low price. The structural system remains the same, it doesn’t have any columns, but there was money available for coating over the bricks in the facades. We built 150 apartments, trying to not over-congest, and it really became a garden for the city. The Lego system was used here as well. Groups of 2 or 3 buildings are attached, having a staircase to share. The outdoor spaces are communal, and in some cases were built into the 1st floor like verandas. For example, in one building I lose an apartment to make a communal outdoor space on the 3rd floor. The people that live there gather in these spaces and spend time together, they drink beer and make churrasco [barbeque] in the weekends, and they wash clothes on weekdays. JT: What is the economic model of Saude? DA: This also began as a social living space under Conde’s municipality, who had the initiative of the project without sponsoring it. Although here we are dealing with a different type of economic model than the one in São Francisco. The citizens here are property owners and got a loan from the Caixa Econômica Federal, which is the national bank of Brazil. But this project was also for low income working class people. 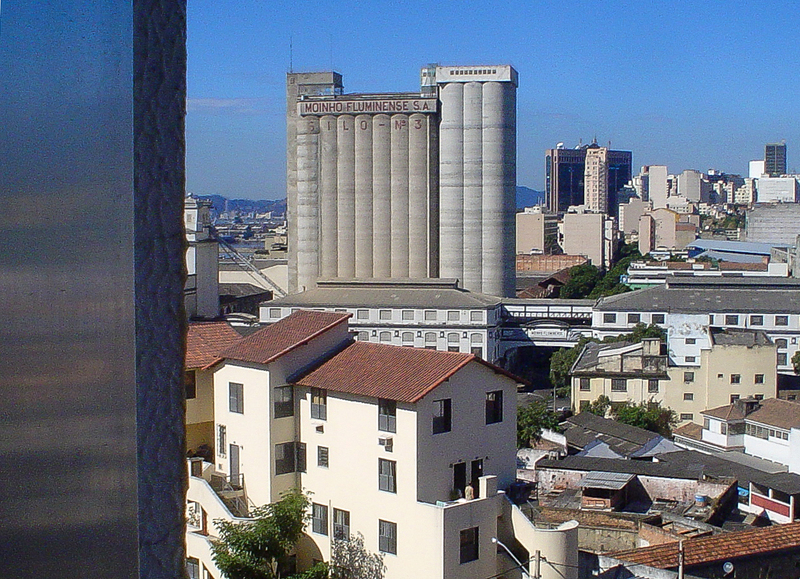 The first apartments were bought at the price of 35-40 thousand Reais [8.900 – 10.000 Euros]. Now, they cost 350 thousand R [89.000 Euros]. Caixa is a very cheap bank and it only exists in Brazil. It was formed during the dictatorship and economists say that it operates with negative interest rate. Employers in Brazil are obliged to pay a steady 8% rate of each of their employees’ wage to the Caixa, as security in the event that they lose their job. The bank uses this money to give out mortgages. Moradas da Saúde settlement designed by Demetre Anastassakis, Rio de Janeiro port area, 2015. JT: How is Saude connected to the broader redevelopment of the port, as well as the major changes happening to the area due to the Olympic Games? DA: This plan in particular was designed while Eduardo Paes was mayor. But the person behind the idea of the port redevelopment was in fact Conde. He was the one who had the idea for the Olympics as well. He knew that it was much cheaper to buy the falling apart buildings of the port than to make a new housing project in the suburbs. In the downtown districts, buildings are old and problematic: the prices drop drastically. So it is a big opportunity for the working class, and people with low income to come. These people bring life back to these districts, they raise the bar, and the prices slowly go up as well. Although there needs to be caution, so that they don’t get kicked out by the market. The architectural design and the expression that will be given in the new design, the genius loci, need particular attention. I think that in Saude we have maintained this balance. JT: Apart from that though, the design for the Olympics aimed to “upgrade” this area from what was seen as an abandoned zone to an area of luxury apartments and offices. DA: I believe that something very important is happening today at the port. I speak as an urban planner as well as an inhabitant of the area. The Olympics and World Cup were a motive to accelerate the change in the area. But with the current crisis, luckily or not, it will take at least 10-20 years to complete the construction, and this will give us the time to correct whatever mistakes might have occurred in the process. I’ll say something that might sound odd: the extreme speculation that we saw in the area has left a paradoxical positive legacy behind it. The permits that were given through the rezoning to construct new high rise buildings might end up ensuring lower cost of living. This is something that would be considered a taboo if it was mentioned a few years ago. But the truth is that the land has a specific value. If you build 20 houses you are left with a certain outcome, but if you build 100 houses –then this is a totally different story. JT: Do you believe that this new potential densification will help the citizens who are living in the area? DA: We have a particular situation here at the port: a lot of the abandoned buildings that are historic and landmarked have been squatted by poor people and drug addicts. But in this area, we don’t have evictions like in Vila Autodromo next to the Olympic park. In my opinion, we need to rethink the housing in the area with a perspective of a mix of social classes, where rehabilitation centers can coexist with middle-class apartments. This pushes the district to approach the local problems anew, without excluding the people that already live here. JT: Have the citizens taken any action to resolve the housing problems at the port area? DA: In the past few years we have seen the constant formation of new housing movements and squats in the area: Quilombo da Gamboa, Vitória or Conquista. There are, also, many low-income citizens with a high level of cultural awareness who were past residents and want to return to the area. More specifically, you have an organized and conscious group that are potential buyers. JT: How could this change in the social profile of the residents be incentivized? DA: The new plan for the port happened simultaneously with the Olympics and contained thousands of luxury apartments in brand new 60-story buildings. But in reality there aren’t enough buyers. We need to build a few pilot buildings, maybe through public and private alliances, which become examples of the potential that the combination of social classes has for the city. This is possible because the funding for social housing, with the subsidy that Lula provided, allows for a piece of property to be sold at a price that does not exceed its cost. In other words, the buyer could pay a small amount using the available fund while the contractor would not be at a loss, since the government would pay for the difference. This is something that businesses have not been able to understand. The municipality is starting to realize it, as well as the social movements. Apart from the dramatic political changes that came during the transition from Lula, to Dilma, to Temer, to the coup, the Ministry of Urban Planning has matured enough and evolved much more than the municipality of Rio. JT: Are you optimistic that something positive could come out of this post-Olympics crisis? DA: Yes, I think that everyone, little by little, will wake up and realize that we need to fix the housing problem of the city, and that we have the financial tools to do so. That’s why I think the construction of housing projects will gradually recover in the next five to ten years. We will need to come up with more sophisticated, less conforming design propositions. I’m not embarrassed to say that a larger market will rise, and a more positive environment for the architects too. Top image: Demetre Anastassakis with lego block, Rio de Janeiro, July 2017. Photo by Jilly Traganou. Jilly Traganou is an architect and Associate Professor of Spatial Design Studies at Parsons School of Design. She is the author of Designing the Olympics: Representation, Participation, Contestation and The Tokaido Road: Traveling and Representation in Edo and Meiji Japan. Together with Mahmoud Keshavarz and Barbara Adams she is editor-in-chief of Design and Culture. It is more complex than it appears. Actually the progressive left government of Worker's Party - PT (4 terms - 14 years until the impeachment) never supported housing policies in Brazil. The creation of Ministry of Cities was a total frustration. "Minha Casa Minha Vida" program is an absolute failure and a repetition of bad solutions from the 30s. The federal subsidy transferred public resource (343 billion Reais - almost 100 billion dollars) to the private sector and creating biggest economic (and political) actors, like construction company MRV, which funded PT political campaigns. It's more complex than that and the leftist administration had a major rule in such type of public policy which increase inequality and spatial segregation. Conde was an ideological centered mayor. As Eduardo Paes who concentred city's investment in the North Zone creating new public spaces and cultural venues like Madureira Park, Deodoro Park or Cine Imperator. But yes, we still don't have housing policies in Brazil. Demetre is an amazing architect and the article is really important to increase public awareness about his important work but the article don't understand the complexities of Brazilian political environment where left and right shared the same concept about urban planning over time and never supported more efective housing policies. It's more complex that this.